As I explained in my election post-mortem, I don’t think Obama has a mandate. But that doesn’t mean we can’t enjoy a good cartoon about his interpretation of the results, and this Bob Gorrell cartoon definitely is amusing. But it’s amusing – albeit in a disturbing way – because it hinges on something that is true. America is heading into the fiscal toilet. Indeed, both the BIS and OECD predict that our long-run fiscal situation is more perilous than Europe’s welfare states. To be fair, we were in a mess even before Obama took office. But Obama wants us to move in the wrong direction at an even faster pace. And he definitely opposes the types of entitlement reforms that could save the country. That’s why the cartoon has some bite. And speaking of cartoons about Obama and Greece, here’s another one with the same message. And the final cartoon in this post also has a Greek theme. 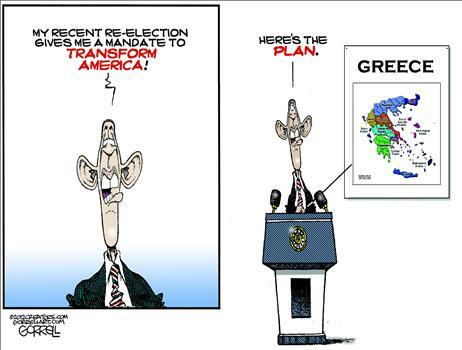 I don’t know if Obama can pull it off but he would take us to Greece if thought he could. The farm in Costa Rica is fine for the longer term. But not now, not yet. Why leave now? These are the golden years of ObamaCare, and other free stuff yet to come. For those of us not in immediate need of new jobs and economic growth, these are the golden years where HopNChangers burn the furniture to keep warm. Regardless of how I feel in the mid-long term, regardless of my nostalgic sadness to see America decline, a few years of cozy warmth on free stuff can be quite pleasant. Just make sure you have another house elsewhere. The voter moths have seen the light, might as well ride their delusion. The trajectories are well known. America was on a fiscal expectations path to decline before Obama indeed. But it was Obama who cemented the decline by triggering the well oiled cultural vicious cycle if suicide: Reacting to decline by temporarily trying to stall it through redistribution and central planning. Addressing declining competitiveness by flattening the effort-reward curves. The additional distortion will have to be repaid with interest. Things are now on an irreversible path not only fiscally but also culturally. The cultural part is primarily Obama’s making. There will be small Pyrrhic victories to give the population hope (who knows maybe even a compassionate Republican president or two) but the path of decline is cemented.